I’ve been writing a lot about BBQ lately, probably because I’ve got Spring Fever and with the “every-other-day” of warm weather here in Maryland, I’m getting jazzed about cooking and barbecueing and smoking outside. I’m planning a full month of BBQ reviews, recipes and goodies for a “May is National BBQ Month” series. If you’d like to be included with your recipe, or pics, or website, leave a Comment below. Maybe you could be a Guest Blogger! 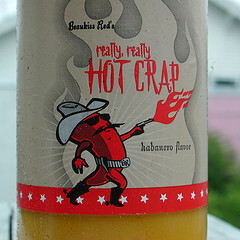 But I assure you, dear friends and chileheads, I have lots of Hot Sauce reviews up my sleeve too. I’ve also been involved with the newly launched series of 31 Days to Building a Better Blog from Darren Rowse and ProBlogger.net and on top of that, I’m working on a re-design of the site using the Thesis Theme by Chris Pearson. There it is, a short update on what’s happening on HotSauceDaily.com . I’m having fun, learning, and trying to continue to bring you the good stuff. Remember – “One Drop is Never Enough” ( tell your spouse ). I am looking forward to what you have to say about bbqing. I am such a novice and really only had a short spin at the end of the Fall with my new grill, so any tips are welcome tips. I found this article to be very good. I have already gone through and read many of your articles. They are great!